Paul Moran's widow paid tribute to her "angel guardian"
Several hundred people have gathered in Adelaide, Australia, to mourn a veteran journalist who died covering the war on Iraq. Paul Moran, 39, who was working for the Australian Broadcasting Corporation (ABC), was killed by a suicide car bomb in northern Iraq on 22 March. The ceremony was held as anti-war protesters held a further demonstration, in Sydney, against Australia's provision of 2,000 troops for the war. The demonstration was smaller than previous events. Opinion polls suggest that a majority of Australians now support military action in Iraq. Moran's wife, Ivana, with whom he had a six-week-old daughter, told the assembled crowd at Our Lady of Victories Catholic Church in Moran's birthplace, Adelaide: "He is my angel guardian". Moran was later buried at a smaller, private service nearby. Two other Australian journalists have been detained by Iraqi authorities in Baghdad, and another Australian reporter has been deported. 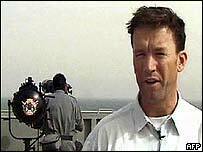 Reporter Peter Wilson and photographer John Feder were under Iraqi guard at the Meridien Palestine hotel in Baghdad, the editor of their paper, The Australian, said. "They are not allowed to leave the hotel, their phones have been confiscated and they are not allowed to file," the newspaper's national security editor, Patrick Walters, told Reuters news agency. On Wednesday, the Sydney Daily Telegraph said its reporter, Ian McPhedran, had been ordered to leave Baghdad. McPhedran told his newspaper the officials accused him of breaking regulations by travelling from his hotel to the Iraqi capital's information ministry building, the French news agency AFP reported. The tide of public opinion appears to be turning in favour of war in Iraq. The BBC's Phil Mercer in Sydney says that organisers of Wednesday's rally are claiming that government propaganda is responsible for this shift in opinion. 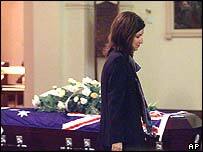 The Australian Foreign Minister, Alexander Downer, is presently in the US for talks on the war in Iraq. Mr Downer said on Wednesday that Washington now supported a role for the UN in Iraq after the conflict.